Revolver MCT Coffee by Green Tea X50 - Big Brands, Warehouse Prices! Just when you thought Bullet Proof coffee couldn’t be improved, x50 has taken it to a whole new level! MCT’s are efficient fatty acids that are readily available and used as fuel upon consumption, often being touted as a keto dieters best friend, while hydrolysed collagen has been shown to enhance tendon and joint repair when consumed around exercise. Coupled with coffee, which provides a natural hit of caffeine, and you have the perfect combination of tendon support, ketogenic energy production and increased cognitive performance. Don’t go into your next session without the right ammunition, use Revolver and blow away your competition. Comprised mainly of Caprylic and Capric Acid, MCT’s are easily converted into ketones for readily available energy and have also been shown to blunt hunger when used as a dietary supplement. Containing naturally high levels of gelatin and glycine, hydrolysed collagen may aid in supporting improved gut and connective tissue health. Supplementing with glycine/collagen prior to exercise has also been shown to directly support tendon and ligament restoration. Providing 71mg of naturally occurring caffeine per serve, coffee has been shown to enhance cognitive function and improves physical performance above almost all other naturally occurring ergogenic aids. Enhance mental performance, increase tissue regeneration and support a state of ketosis while still enjoying a delicious coffee! 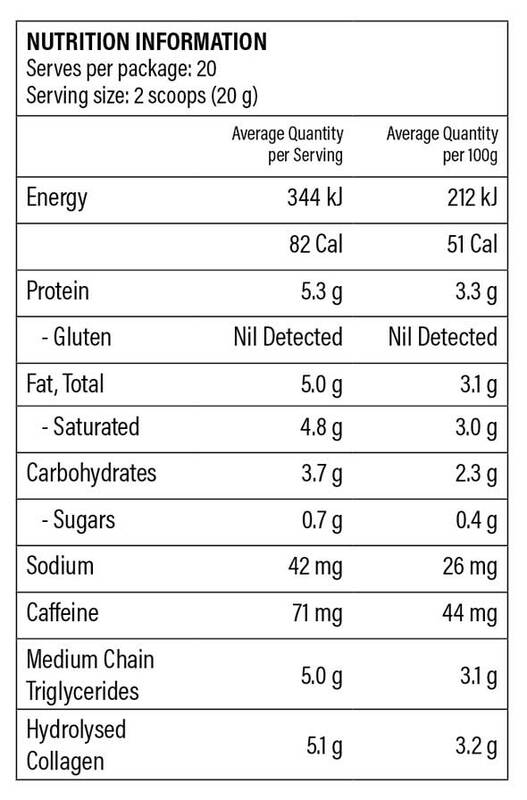 Ingredients: MCT Powder 25% (Medium Chain Triglycerides, Glucose Syrup Solids, Milk Protein, Emulsifier (471)), Hydrolysed Collagen, Sweetener (Erythritol), Coffee Powder 8%, Natural Flavours (Milk), Celtic Sea Salt (0.5%). Good coffee, tried hazelnut flavour.